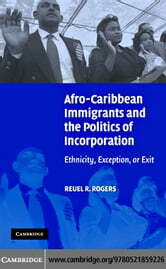 This book examines the political behavior of Afro-­Caribbean immigrants in New York City to answer a familiar, but nagging question about American democracy. Does racism still complicate or limit the political integration patterns of racial minorities in the United States? With the arrival of unprecedented numbers of immigrants from Asia, Latin America, and the Caribbean over the last several decades, there is reason once again to consider this question. The country is confronting the challenge of incorporating a steady, substantial stream of non-­white, non-­European voluntary immigrants into the political system. Will racism make this process as difficult for these newcomers as it did for African Americans? The book concludes discrimination does interfere with the immigrants' adjustment to American political life. But their political options and strategic choices in the face of this challenge are unexpected ones, not anticipated by standard accounts in the political science literature.